Sri, Edward (2011-01-04). A Biblical Walk Through The Mass: Understanding What We Say And Do In The Liturgy (Kindle Locations 1508-1512). Ascension Press. Kindle Edition. In the bible, the word “remember” means much more than just thinking about a past event. When the good thief on the cross asked Jesus to “remember me in your kingdom,” he wasn’t expecting Jesus to go to heaven and just think about him. Rather, he meant “remember me” to mean to be physically present with Jesus in heaven. The Catechism of the Catholic Church makes a similar point: In the sense of Sacred Scripture the memorial is not merely the recollection of past events but the proclamation of the mighty works wrought by God for men. In the liturgical celebration of these events, they become in a certain way present and real. This is how Israel understands its liberation from Egypt: every time Passover is celebrated, the Exodus events are made present to the memory of believers so that they may conform their lives to them. Sri, Edward (2011-01-04). A Biblical Walk Through The Mass: Understanding What We Say And Do In The Liturgy (Kindle Locations 1513-1519). Ascension Press. Kindle Edition. A modern day example of this is a movie. I wasn’t around when the Wizard of Oz movie was created in 1939, but thanks to it being on film, it has been re-presented to me over and over again, on TV and on DVD. I must say, the acting was just as good the last time I saw it as it was the first time I saw it. Like the Eucharist, the sun is re-presented to us on a daily basis, in the morning. It isn’t a new sun we see every morning, but the same old sun which has been around since the creation. The Eucharist is like that. In the case of the Mass, the exact same unbloody sacrifice that occurred at the Last Supper, where Jesus’ blood was separated from His body in the Eucharist before the apostles consumed them, is made physically present to us through space and time, which is anamnesis. Many people don’t believe Jesus in John 6:48-58 when he said 4 times that he is the bread of life from heaven and if we eat this bread we shall live forever, but those people walk by sight, not by faith. John 6: I am the bread of life. Your fathers ate the manna in the wilderness, and they died. This is the bread which comes down from heaven, that a man may eat of it and not die. I am the living bread which came down from heaven; if any one eats of this bread, he will live forever; and the bread which I shall give for the life of the world is my flesh." The Jews then disputed among themselves, saying, "How can this man give us his flesh to eat?" So Jesus said to them, "Truly, truly, I say to you, unless you eat the flesh of the Son of man and drink his blood, you have no life in you;  he who eats my flesh and drinks my blood has eternal life, and I will raise him up at the last day. For my flesh is food indeed, and my blood is drink indeed. He who eats my flesh and drinks my blood abides in me, and I in him. As the living Father sent me, and I live because of the Father, so he who eats me will live because of me. This is the bread which came down from heaven, not such as the fathers ate and died; he who eats this bread will live forever." In John 6, the context of this takes place during the Passover, and the manna from heaven is brought up, as is the multiplication of the loaves, so the entire chapter deals with both unleavened and miraculous bread. Later on, in John 6:66 (ahem), his own disciples leave him over this command to eat His flesh and drink His blood. He does not explain to them that this is only a parable, and to come on back, because he was talking symbolically. Rather, He lets them go. We know from Mark 4:34 that Jesus ALWAYS explained His parables to His disciples. But here He didn’t. Therefore, this is no parable, but is a literal command to eat His flesh and to drink His blood. A year later, Jesus does this at the last Supper. But in the New Testament Church, God sends down the fire of the Holy Spirit to transform unleavened bread and wine into His body and blood so that we can consume Him. God dwells in the Tabernacle of each Catholic Church. The Mass is comprised of two basic liturgies, or ceremonies. The first part is the Liturgy of the Word, where prayers of Adoration, Contrition, Thanksgiving, and Supplication are mixed in with 3 (on Sunday) scripture readings. The Scripture readings are usually one from the Old Testament, one from the epistles, and one from the Gospels. To show the harmony of sacred scripture, the 3 readings always have a common thread, like salvation, repentance, the Eucharist, etc. Hebrews 12:22: But you have come to Mount Zion and to the city of the living God, the heavenly Jerusalem, and to innumerable angels in festal gathering,  and to the assembly of the first-born who are enrolled in heaven, and to a judge who is God of all, and to the spirits of just men made perfect,  and to Jesus, the mediator of a new covenant, and to the sprinkled blood that speaks more graciously than the blood of Abel. The biblical story of Jesus on the road to Emmaus with his disciples is another example of the Mass after the Last Supper. The disciples and Jesus discussed the scriptures (liturgy of the Word), Jesus gave them a sermon on what the scriptures meant, and then they had a meal where the bread was blessed and the disciples recognized Jesus in the breaking of the bread (liturgy of the Eucharist). Jesus then disappeared from their sight for a reason. From now on, Christ would be invisibly present in the bread and wine, and His physical presence would no longer be necessary. From now on, we walk by faith, not by sight, when it comes to the Eucharist. Jesus said to satan in the desert – “Man does not live by bread alone, but on every word that comes from the mouth of God. Here Jesus foretells the Mass, with the Liturgy of the Eucharist AND the Liturgy of the Word. Here we see that participating in Holy Communion IS the very essence of the new covenant – Notice he didn’t say that the new covenant was just believing in him, or reading about him. No, the new covenant is an action – participating in Holy Communion. And notice that the word “is” is used, without any reference to symbolism or representation. "My Father, if it be possible, let this cup pass from me; nevertheless, not as I will, but as thou wilt." Finally, on the cross, Jesus drank the sour wine and said in John 19:30: “It is consummated.” The Passover meal started in the upper room was finished on the cross, forever tying the Eucharist to the crucifixion of Christ. (Also, Jesus the bridegroom, consummates his marriage to mankind). It is important to remember that in the Mass, Jesus is both priest and victim. We learn in Hebrews 6:20 that Jesus is a high priest forever, according to the order of Melchizedek. Melchizedek, the King of Salem (shalom, or peace) and the High Priest, in Genesis 14:18, offered blessed bread and wine to Abraham in honor of his victory over his enemies and the rescue of Lot. After the golden calf incident, priests in the Old Testament were according to the order of Levi, and they offered sacrifices for sin, only they offered animal sacrifices instead of bread and wine. God commanded these animal sacrifices because the Israelites, while slaves in Egypt for 400 years, had begun to imitate the Egyptians and worship cattle, sheep, and goats. These animal sacrifices came to a halt with the destruction of the Jewish Temple in 70 AD, and Judaism stopped having priests offer sacrifices. Now, Judaism only has rabbis, or teachers. But Jesus said he came to fulfill the Old Testament, in Matthew 5:17, not to do away with it. So now HE is the new eternal high priest and king of peace (salem, or shalom), continually offering up the one same divine sacrifice of 2000 years ago to each new generation in the Mass, in the form of bread and wine, like Melchizedek. If he wasn’t doing this, then He wouldn’t be a high priest forever. In Revelation 5:6, John says He sees a lamb standing as though slain, which perfectly describes a priest standing who is also a victim. Malachi 1:11-12:  For from the rising of the sun to its setting my name is great among the nations, and in every place incense is offered to my name, and a pure offering; for my name is great among the nations, says the LORD of hosts. But you profane it when you say that the LORD's table is polluted, and the food for it may be despised. Some references to things in the Mass are included in the Book of Revelation, which shows St. John the heavenly liturgy going on, the marriage supper of the lamb. 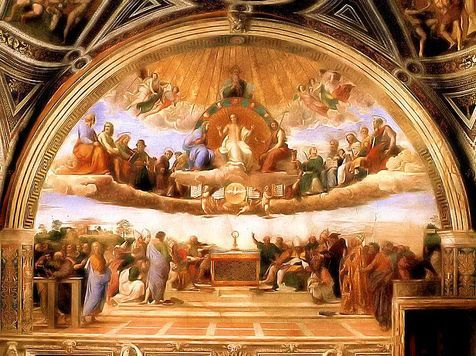 The Mass on earth participates in that heavenly liturgy while it is being said, and we in the pews join with the heavenly host in praising God during the Mass. The Eucharist overcomes satan’s two lies to Adam and Eve in the Garden of Eden. Satan said, “If you eat the forbidden fruit, you will not die.” Jesus said if you eat His flesh and drink His blood, you will live forever. Satan said, “If you eat the forbidden fruit, you will be like gods.” Jesus said that if you eat His flesh and drink His blood, that He will abide in you, and you in Him. So here we see the divine fruit from the tree of life known as the cross (Acts 5:30) overcomes the forbidden fruit from the tree of knowledge of good and evil. Both Ezekiel (3:3) and John (Revelation 10:10) in the Bible ate a scroll, or the Word of God, which tasted like honey. In the Eucharist, we eat the word of God made flesh. Revelation 19: 9: And the angel said to me, "Write this: Blessed are those who are invited to the marriage supper of the Lamb." And he said to me, "These are true words of God." 1 Corinthians 10:  The cup of blessing which we bless, is it not a participation in the blood of Christ? The bread which we break, is it not a participation in the body of Christ? Because there is one bread, we who are many are one body, for we all partake of the one bread. Consider the people of Israel; are not those who eat the sacrifices partners in the altar? What do I imply then? That food offered to idols is anything, or that an idol is anything? No, I imply that what pagans sacrifice they offer to demons and not to God. I do not want you to be partners with demons. You cannot drink the cup of the Lord and the cup of demons. You cannot partake of the table of the Lord and the table of demons. 1 Corinthians 11: : For I received from the Lord what I also delivered to you, that the Lord Jesus on the night when he was betrayed took bread,  and when he had given thanks, he broke it, and said, "This is my body which is for you. Do this in remembrance of me." In the same way also the cup, after supper, saying, "This cup is the new covenant in my blood. Do this, as often as you drink it, in remembrance of me." For as often as you eat this bread and drink the cup, you proclaim the Lord's death until he comes. Whoever, therefore, eats the bread or drinks the cup of the Lord in an unworthy manner will be guilty of profaning the body and blood of the Lord. Let a man examine himself, and so eat of the bread and drink of the cup. For any one who eats and drinks without discerning the body eats and drinks judgment upon himself. That is why many of you are weak and ill, and some have died. Hebrews 13:10: We have an altar from which those who serve the tent have no right to eat. For the bodies of those animals whose blood is brought into the sanctuary by the high priest as a sacrifice for sin are burned outside the camp. So Jesus also suffered outside the gate in order to sanctify the people through his own blood.